It's great when you bring your camper or caravan to a spot you couldn't, but sometimes it's better to unhitch. 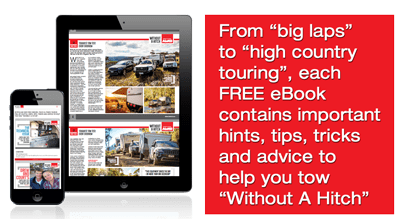 We all love the fact that our caravans and campers allow us to access and stay at places we otherwise couldn’t but, sometimes, that same caravan or camper becomes a dead-weight on the towball, preventing us from getting into some seriously exciting terrain. 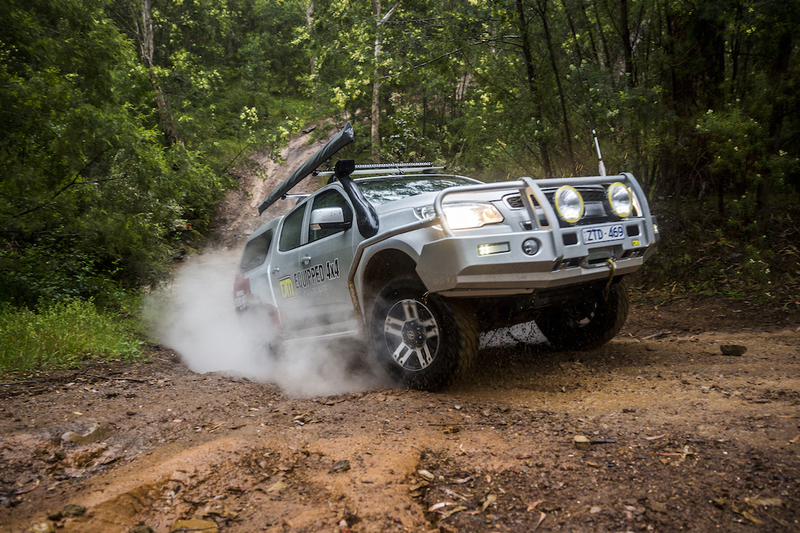 When that happens, there’s no option but to unhitch, lock it up and head off unencumbered for a 4WD-only adventure! 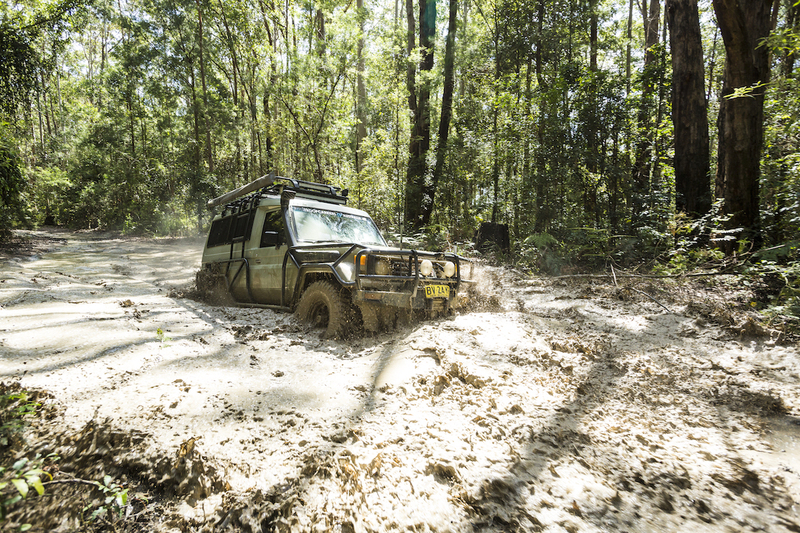 Less than two hours’ from Sydney, the Watagan mountains and surrounding state forests offer a true, 4WD-only adventure that makes the perfect weekender for those with a lust for adventure! When you arrive, pick your campsite from one of five designated areas within Olney State Forest, unlimited bush camping, or the 4WD-only Pines Campground in Watagans NP, unhitch the trailer and get ready for some solo excitement! There are literally hundreds of bush tracks to explore throughout the area, so it’s just a matter of picking one you like the sound of and heading off! This is true low-range country. Creek Road Track is not one for the faint-hearted, especially after rain, as the name implies! The tracks winds down into the valley before climbing back out in a loop – the track is muddy, very muddy, the incline is steep and the wheel ruts are massive, so hold on to your seats! 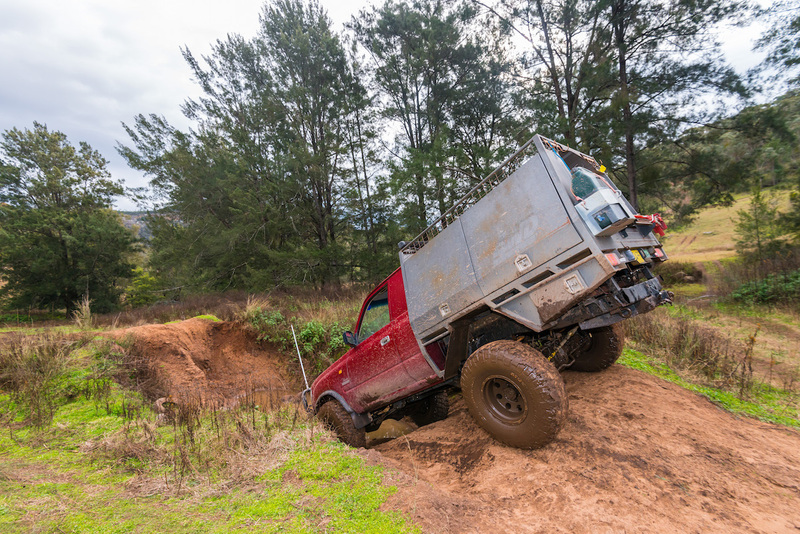 Once you’ve exhausted yourself – and your 4WD – there are other things to explore in the area as well, including nearby Gap Creek Falls, for a quieter type of enjoyment! Getting there: The Watagans National Park is 140km north of Sydney. Camping: Limited camper trailer camping is available at Gap Creek campground (4WD-only). The Pines Camping Area (2WD) is one of five camper-trailer friendly campgrounds within nearby Olney State Forest. 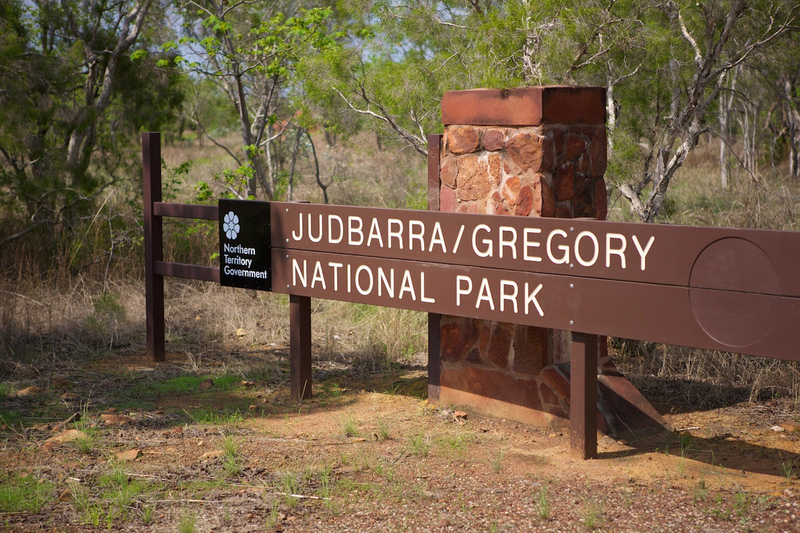 Judbarra (Gregory) National Park, in the Northern Territory, is a great place to find some 4WD-only adventure as parts of the park are accessible by 4WD vehicles and offroad campers, meaning you can travel into the park, leave the camper there and head off unhitched for a few hours or days! The park encourages 4WDing and is made up of a network of 4WD-only tracks, which vary in length and follow ancient stock routes in the area. Jasper Gorge is the most easily-accessible part of the vast 13,000sqm park for those with trailers, however, there is no camping or overnight parking here. Campers will have to continue on up the Buchanan ‘Highway’ (a graded, gravel road) to Timber Creek and unhitch before retracing their steps. But those who arrive solo can set straight off from Jasper Gorge up the rough, stony, 4WD-only 20km-long Tuwakam Track. The track is not technically difficult but could take several hours to complete over hard, bumpy, limestone! This track connects the eastern and western sections of the park and links the Bullita Access Track to the Buchanan Highway near Jasper Gorge. ck to Timber Creek via the Buchannan Highway makes a pleasant day trip. Getting there: Take the Victoria Highway from Katherine or the unsealed Buntine and Buchanan Highways. Access is during the Dry season (May to November) only. Camping: Available at Bullita and Limestone Gorge for camper trailers. There is no parking for caravans within the park, only at the Victoria River Roadhouse. When it comes to spectacular scenery, the Victorian High Country would have to be one of the most highly regarded destinations in the country. And a solo 4WD is, without a doubt, the best way to experience the High Country. You’ll need nerves of steel to tackle some of the steeper tracks in the region – they range from mild to absolutely insane. Drop into the picturesque town of Dargo and leave the camper or caravan there before heading off towards Talbotville and the Crooked River Track. If you like river crossings, Crooked River is the one for you. It features 24 river crossings in just 7km and is a good way to gently introduce yourself to the region. But if that seems a little tame to you, why not head on up the infamous Billy Goat Bluff Track? If you like heart-in-throat driving, then scrambling for roughly 7km up a near-vertical track should do the trick. About three quarters of the way up, you’ll get the chance to stop at ‘The Bluff’, which is basically a narrow ridge-line section that gives you the opportunity to stop and take in all the scenery. But with sheer drops either side, you’ll feel like you’re balancing on a knife’s edge, and continuing further doesn’t get much easier either, with several rock steps to conquer before you actually hit the summit. If you own a 4WD and are keen for the adventure of a lifetime, it’s pretty hard to beat the Victorian High Country. It’s the sort of place that keeps you hanging to go back, but can leave a lump in your throat just thinking about those dicey sections with steep drop offs. Getting there: Dargo is 316km north-east of Melbourne. Camping: Dargo or Talbotville, 45 minutes from Dargo. Talbotville is a wide open paddock with pit toilets and river frontage. Looking for tough tracks, majestic camping and freedom to have a blast? Well, Bylong Creek 4X4 Park has got it all. Here, you can pull straight into camp, unhitching the camper and be hitting up some of the gnarliest tracks you can find with the 4WD within minutes. The park, which is privately owned, is a true 4WD paradise, without many of the restrictions and limitations placed on tracks and drivers in national parks, for example. You can basically show up and do pretty much whatever you want! There’s a whole maze of tracks throughout the park to choose from, and even some crazy man-made features like the ‘Wombat Hole’, which the park owner took to with a bobcat! Those in stock-standard factory vehicles may struggle a bit here, but it’s all in good fun! Getting there: Bylong Creek 4X4 Park is located 50km east of Mudgee, 60km north of Rylstone, 3-3.5 hours from Penrith, and three hours from Newcastle. Camping: The tracks are great fun at Bylong, but the camping is excellent, too. You can basically camp wherever you want, but there are two main campgrounds if you feel like making friends. Campsites are $15/day. 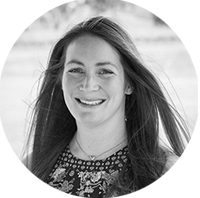 An RV journalist working across Australia’s premier caravanning and camping magazines for the past five years, Laura is also a judge at the annual Best Aussie Vans awards. She has been camping in the great outdoors since the of two, when she was packed, by day, into a Toyota LiteAce van and, by night, into a brown canvas tent with her parents and two siblings for an extended trip around the vast playground that is northern Western Australia.